One of the hardest things about being a student isn't necessarily the actual work we'll be doing, but rather finding the time to DO that work. We all lead busy lives, we procrastinate, and there's always something we'd rather be watching on Netflix than doing homework. 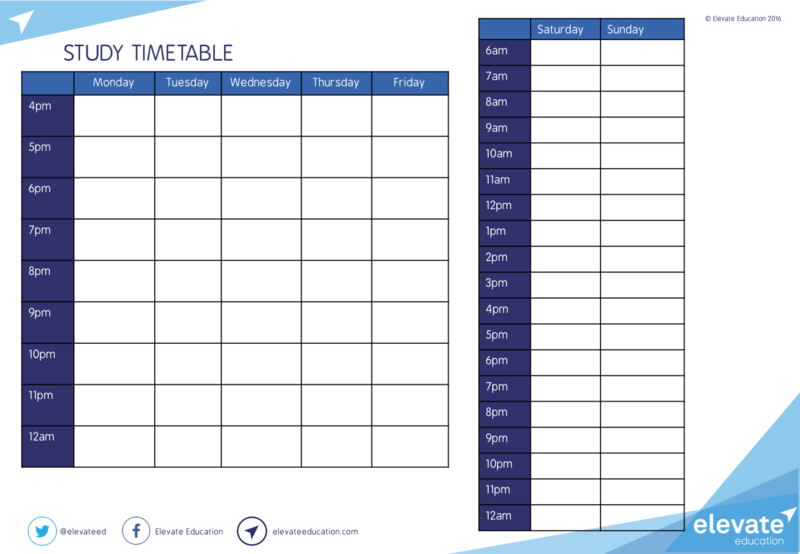 One of the best ways to make sure we've got the time to study is to create a study timetable. Before you cringe at the term, check out the 3 steps below for making a study timetable that you will actually stick to. Most people mistakenly begin making a timetable by zealously filling it with study. This is a massive mistake. By putting in the study blocks first, students overcommit to hours that are unrealistic and that can't be adhered to. This often leads to students getting stressed, overwhelmed, and ultimately giving up on the entire process of using a timetable at all. Of course, it's difficult to know in advance each activity you will do. Nobody wants to live life on such a tight schedule, but getting a rough estimation of when you do things will be a good start. Once you have identified the key times for activities, you can move to step 2. Once you have identified all the leisure and extra-curricular activities, the next step is to put those activities into the study timetable (click on the timetable above to access a digital version). Once you have put in all your activities, you will notice that the study timetable has many blank spaces or gaps left in it. These gaps are the times that you can study in. Rather than putting in specific tasks here, you should just nominate these time blocks for studying. If you don't have any blank spaces left over, perhaps it's worth thinking about what activities you can remove. By reversing the process of organising a study timetable (fun stuff first, study second), we reverse the perception of a study-timetable. It is no longer a study-timetable that life has to fit around, it is a life-timetable that study fits around. This means that you're prioritising the things you love, while still leaving plenty of time to study. In turn, this means you're willing to study in those periods because you know that you are not sacrificing the things that you want to do. Also, it's important to keep in mind that this study timetable should be used as a guide, not as a rule book. The aim is not to stick to it 100% and live life by such regimented time-slots. If you can stick to the timetable 60% of the time, that should be considered a 'win'. Sometimes you will get to a study timeslot and you will just feel like relaxing - that's fine! Equally, you may get 30 minutes into an X-box game or find that you've had enough snapchat for the day and decide it's time to hit the books. Either way, plan in advance and stay flexible too! Good luck! It can be pretty frustrating to hear your parents say, "are you doing enough study?" A great way to get around this is to print/email your study timetable, give your parents a copy and say "this is my plan. I will try my best to stick to it. I still need my week to be flexible, but here's a snapshot of the times I plan to be studying in." Alternatively, you can even sit down and make the timetable together. This will help your parents see that you're being responsible and it will also keep you accountable because they now have a copy too. If you haven't already, get your timetable by clicking on the image above. You can fill it in online or print it off and do it by hand. Good luck! Glad to hear Josh! Remember to update it every couple of weeks so that it stays relevant to you life! Good luck and any questions, let us know in the comments! You need to click on the picture of the timetable. You cant fill it in on line? is there a pdf you can download or an excel document? Thanks. Hi there, if you click on the image of the timetable it will open in a new window and you'll be able to download the template. Omergurd I always wanted this, thank you for the great assistance. For those who are having trouble downloading the study timetable PDF. Click on the second picture of the study the timetable, to download it.